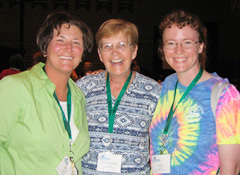 The Conference of Presentation Sisters, or the Conference, represents hundreds of Presentation Sisters from seven congregations. These congregations are located in Aberdeen, South Dakota; Dubuque, Iowa; St. John’s, Newfoundland (Union: Newfoundland and Labrador Province); New Windsor, New York; Staten Island, New York; San Francisco, California; and the United States Province of the Union, western and southern states of the Union. The Conference of Presentation Sisters exists to provide opportunities for collaboration of the members on matters of mutual interest, to promote unity, to strengthen the spirit of Nano Nagle, and to encourage the works of the sisters to fulfill the mission in the Church. In other words: greater collaboration, connection and communion.